On a wet sidewalk in San Francisco’s Tenderloin, Michael Cameron approached a middle-aged man snorting a white powder cupped in his hands. Cameron, a 65-year-old volunteer in the neighborhood, asked the drug user to move across the street. He knew hundreds of schoolchildren soon would be walking by. 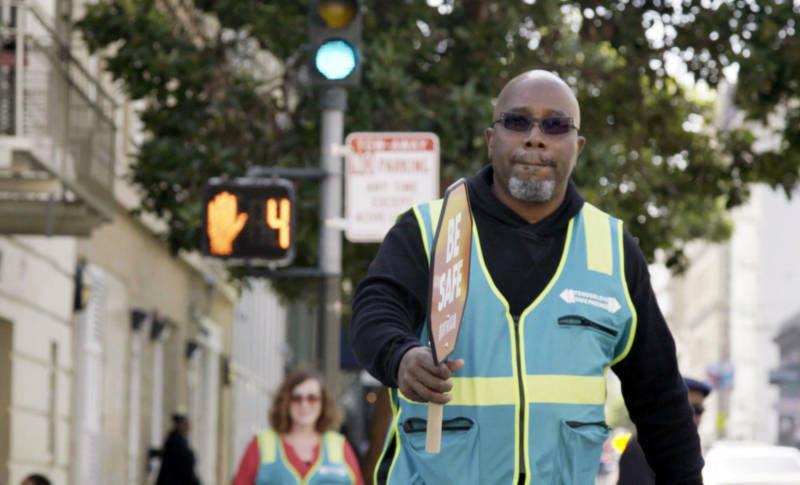 Cameron is one of about two dozen volunteers with Safe Passage, a citizens’ effort that transforms the Tenderloin’s sidewalks into a more kid-friendly environment a couple of hours every schoolday. The Tenderloin is notorious for the homelessness on its streets and open drug use and sales. But it is also one of the few affordable neighborhoods left in one of the most expensive cities in the nation, and is home to hundreds of low-income and immigrant families. U.S. census figures report 2,200 children live in the Tenderloin, but local nonprofits estimate there are more than 3,000 kids in that neighborhood, between Union Square and the Civic Center. For decades, the Tenderloin has attracted immigrant families and workers because of its high density of affordable housing. In a city where median rents have skyrocketed to nearly $4,200 a month, the Tenderloin represents an island of affordable studios, one-bedroom apartments and residential hotels. “It’s a whole different world than the rest of San Francisco,” said Randy Shaw, who directs the nonprofit Tenderloin Housing Clinic and has worked in the neighborhood for about 40 years. About 80 percent of the housing units in the neighborhood are under rent control or permanently affordable, according to a report by the Tenderloin Neighborhood Development Corp. Working-class families worried about safety in the Tenderloin have few options to move to other parts of the city where rents are higher. 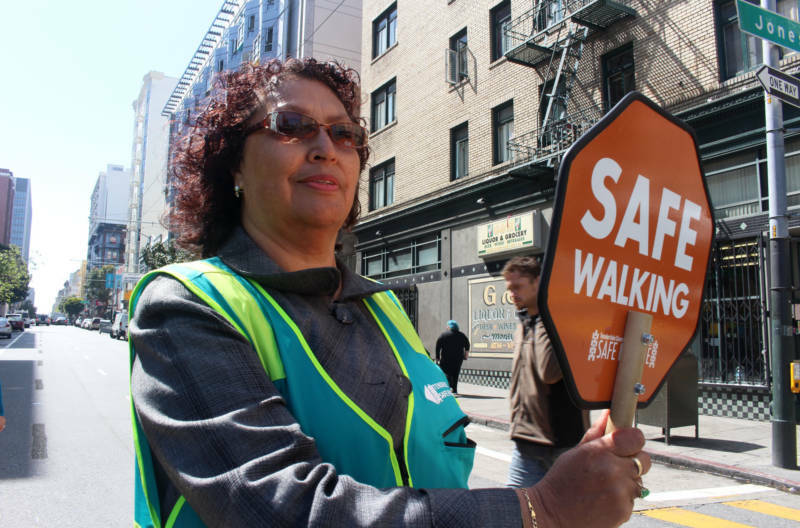 Over 10 years ago, Mena and other moms in the Tenderloin began meeting with the goal of making streets safer for kids walking to and from three schools in the neighborhood. That push became Safe Passage. During morning and afternoon shifts, Mena, Cameron and other volunteers head out in pairs to their assigned corners. The walkie-talkies they carry frequently crackle with short messages about what’s happening on their route -- if human waste litters sidewalks, or if people hanging out on the corners need medical attention. 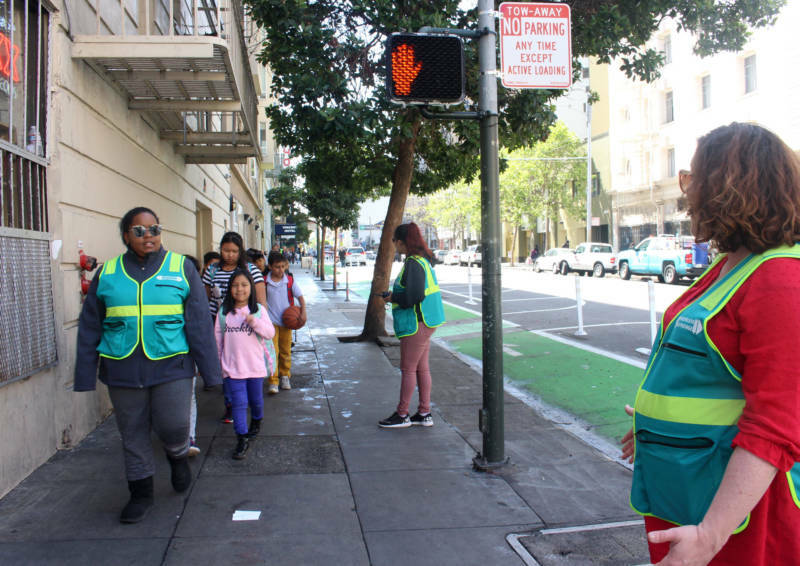 The “corner captains” are easily recognizable because of the neon-green vests they wear as they hold up stop signs and help kids cross the busy intersections. 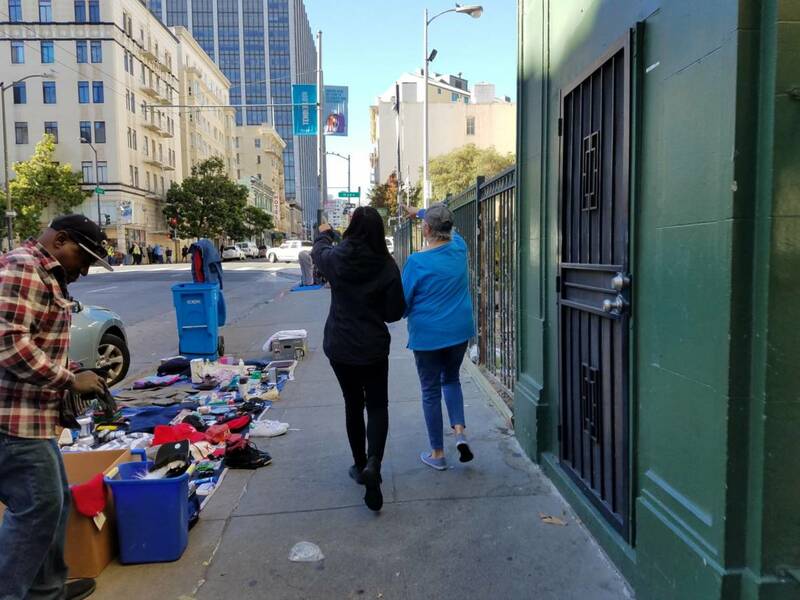 Safe Passage volunteers, most of whom are Tenderloin residents and parents, are now familiar faces to 8-year old Diana Eusebio. Some of the Tenderloin streets that Diana and her classmates walk on are considered some of San Francisco’s biggest “drug hotspots” by city agencies. But when Safe Passage volunteers are out there, the community sees improved safety, said San Francisco police Officer Eric Robinson. “I think it's been fantastic. I've seen improvement in the cleanliness of the street. I've noticed that there's less crime and calls for service,” said Robinson, who walks the Tenderloin beat. Often, a couple of SFPD officers are visible along the Safe Passage route to help keep “a positive atmosphere,” said Kate Robinson, who directs Safe Passage and has no relation to Officer Robinson. It’s an example of the many collaborations people in the program have built over the years to be effective in the neighborhood. Why Hasn't the Tenderloin Gentrified Like the Rest of San Francisco? The experience of standing at the same corner for about six years has shown her a different side of the Tenderloin. She points to the time she witnessed a child falling out of a fourth-floor window. “A group of drug dealers caught her and saved her life and nobody would know that story. We were standing there and we saw this happen,” she said. Throughout its history, the Tenderloin has welcomed working people and, since the 1970s, many immigrant families. The neighborhood has also been an area for vice, said Katie Conry, executive director of the nonprofit Tenderloin Museum. “That looked really different in the ’20s, ’30s and ’40s. It was more glitzy. The primary underground economy was gambling, but it’s still a vice area in a lot of ways,” said Conry. An often misunderstood or ignored neighborhood, the Tenderloin is an area where larger issues collide, such as income inequality and the housing crisis, said Conry. About half of the city’s homeless population -- and services for them -- are concentrated in the Tenderloin and a neighboring area. “The Tenderloin is this place that’s really empathetic and supportive that didn’t cause all these issues to happen,” said Conry. As San Francisco and the state wrestle with those huge problems, Margarita Mena said she’s proud of what she and other residents have accomplished with Safe Passage, which is now part of the nonprofit Tenderloin Community Benefit District. She will continue volunteering for the program as long as she lives in the Tenderloin. “It makes you feel good, because you are doing something good for children and for your community,” she said. Farida Jhabvala Romero reports on immigration, economic opportunity, and race and ethnicity for KQED.